Data Center Infrastructure Market size was valued at around USD 40 billion in 2017 and will grow at a CAGR of over 10% from 2018 to 2024. Growing need for cloud storage, rise in the adoption of online and mobile computing services, and the growing usage of social media have led to a rise in the number of data centers globally. The rise in the number of internet users will facilitate the need for more storage equipment thereby driving the data center infrastructure market. IT & telecom, BFSI, and healthcare organizations are expected to be the largest adopters of the facilities as it aids them in the management of a large array of mission-critical applications from latency-sensitive trading to basic storage and computing. The need for multi-layered operational security is also one of the factors driving the data center infrastructure market demand, amongst the financial institutions. The data center infrastructure market is poised to grow owing to the high growth of organizational data and the rise of big data. Rapid industrialization and the increase in outsourcing activities, primarily in countries including China and India, have contributed to the high growth of organizational data traffic comprising customer information such as personal and financial data. To accommodate this high data traffic, companies are increasing their expenditure on construction of new facilities. Moreover, the penetration of cloud computing has further increased the competitiveness of the industry as various companies, such as AWS and Google, are actively investing in the technology to help in the easy scaling of the data center resources and gain more visibility in the activities. DCIM is anticipated to witness a high growth rate of over 20% in the overall data center infrastructure market owing to the ability of the solutions to efficiently manage the facility operations and enhance the design and planning of the infrastructure. Several DCIM vendors are offering solutions, which aid in reducing the system downtime by controlling the numerous activities of the facilities such as the management of the overall infrastructure, installation & integration, and cooling & power management. Moreover, the solutions help in providing insights into the efficiency levels of different equipment and its performance metrics, helping businesses and companies in better managing the power consumption levels. It also makes the system and device monitoring easier, more customizable, and flexible across a varied range of user requirements. The data center infrastructure market is competitive owing to the presence of several key players operating in the industry. An exponential rise in the number of businesses has led to the rising pressure about enhanced data storage solutions. Hardware forms a crucial part of facilities that determine the quality of solutions offered by companies and is expected to be valued at over USD 60 billion. Key players are focusing on incorporating the latest advanced technologies, such as AI, into their equipment. Increasing demand for data storage and applications from enterprises will drive the hardware data center infrastructure market over the forecast timeline as the infrastructure is central to IT architecture. Moreover, the complex and independent nature of equipment has compelled the demand for more automated and smart infrastructure management solutions. Technological evolutions, such as the rollout of 4G/LTE networks, are providing an impetus to the data center infrastructure market growth. The trend of colocation is gaining traction due to several advantages offered by colocation providers. The colocation applications estimated to hold the revenue share of 24% in 2017. Constructing new facilities drains a company’s vital resources such as time, labor, and money. Moreover, it is also not preferred by businesses that have limited data storage requirements and budgetary constraints. Colocation providers are offering enhanced services to operators such as power, cooling, and maintenance of infrastructure. Retail colocation provides cabling, cooling, space, power, and support services, which are major factors driving the colocation data center infrastructure market growth. Moreover, rapid technological developments, such as IoT and cloud services coupled with an increase in the data storage requirements in large enterprises, are supporting the industry growth. Asia Pacific data center infrastructure market is anticipated to witness substantial CAGR of 14% over the forecast period, owing to the presence of number of smartphone users and several electronic companies. The rise in the number of data centers, primarily in China and India, is fueled by the large-scale adoption of the facility by the SMBs, that are running the mega facilities and increasing the demand for supplementary equipment. China accounted for the majority of the IT & telecom industry growth, which primarily attributes to an upsurge in the sale of smartphones. With this growth, the region will witness an increase in the amount of mobile internet users, thereby positively impacting the growth of the industry. Several companies are seeking the infrastructure, enabling the complex operations to become more dependable and flexible with the ability to scale rapidly. 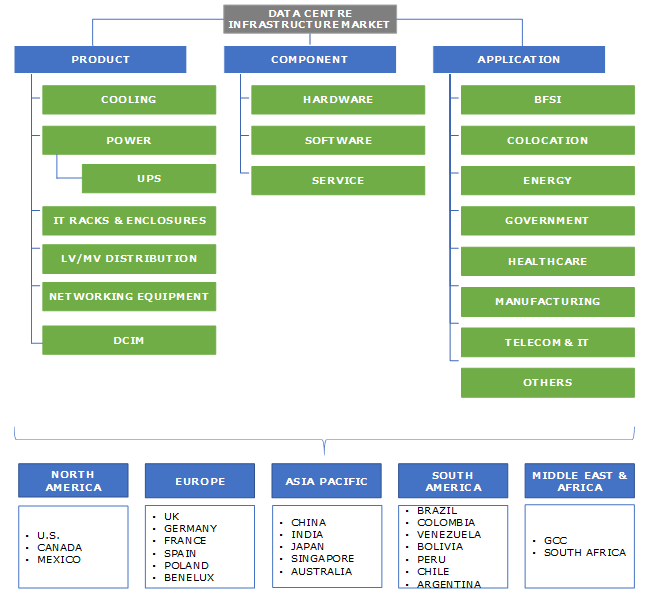 Major players operating in the data center infrastructure market include Airedale International Air Conditioning Ltd., ANEXIA Internetdienstleistungs GmbH, Asetek, Black Box Corporation, ClimateWorx International, Degree Controls, Inc., Dell, Inc., Eaton Corporation Plc, Panduit Corporation, Rittal GmbH & Co., KG, Schneider Electric S.E., Submer Technologies Sl., and Vertiv Group Corporation, among others. Strategic alliances, collaborations, and joint venture strategies are the common trends in the industry. Manufacturers are collaborating with system integrators to launch new solutions. System integrators are also partnering with other companies to offer enhanced solutions. For instance, in November 2015, Extreme Networks collaborated with VMWare to enable interoperability between its switches and the NSX network virtualization platform. The data center infrastructure market ecosystem is consolidated in nature and consists of few players. The products and services offered by the vendors are being implemented and used across the entire value chain, allowing several engineering companies and businesses in a variety of industries such as BFSI, colocation, energy, government, healthcare, manufacturing, and IT & telecom. The demand for facilities is rising from the end users owing to the increasing number of businesses and companies switching to automation for improving their business operations. The trend of customization is also quite prevalent in the data center infrastructure market to create cost-effective and time-sensitive solutions.